Its been a while since I have blogged due to having completed my training and gaining my NPPL(M) in June,’ I’m flying a lot, but don’t think it will be of great interest to those who read this blog! Thus I have asked my friend and fellow C42 share holder to write a guess blog for you. 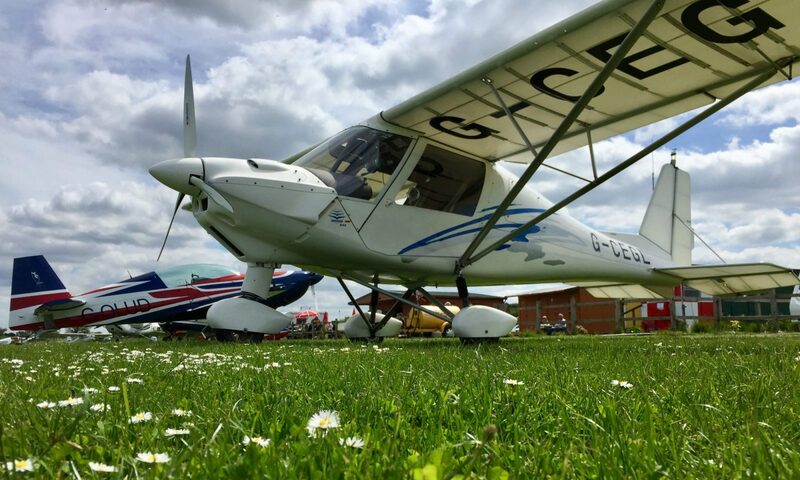 Today I left early (about 09.30) for the airfield in the hope that I would be able to go flying with my good friend and fellow airplane shareholder Adrian. It took me a little longer than usual to get to the airfield as I got stuck behind multiple agricultural vehicles en-route, which is normal for this time of year in these parts as they are harvesting sugar beat. Upon arrival at the airfield I could see that Adrian was already there and some others had just arrived also; walking into the clubhouse I was greeted with a cup tea that had already been made for me, which is always greatly appreciated. I had about 3 hours before my scheduled lesson so Adrian and I talked about where we could go in the meantime. Unfortunately, the weather wasn’t that great, the cloud base was quite low and rain looked likely although it was not forecast until much later in the day. We ruled out going over to Cromer as the weather looked worse that way; a northerly wind was bringing unpredictable weather in off the North Sea. So we thought we might try a trip up to Skegness as we have never been and it wasn’t too far away, but in a northerly direction also. Pat and Colin said they were going to Skegness but they have a lot more experience than us, so we said we might but would get the airplane up and see what the conditions were like; we had thought that if it wasn’t too good up there we would just pop over to Fenland for brunch, they are only 16nm away and have a really good restaurant; well worth a visit if you are in the area, they also have a great ground radio service. The aeroplane had its 100 hour service the day before and we were the first to fly it so we wanted to do a couple of circuits and just make sure the aeroplane was okay before we went anywhere too far afield. Everything with the aeroplane was fine and was actually improved as we had a new oil pressure sensor fitted so the readout on the gauge in the cockpit was showing as it should now. We took off and did a circuit with a touch-and-go and then climbed out to the east towards Ely as the parachute aeroplane had taken off as we turned onto finals for our touch-and-go. We only got to about 1500ft as the cloud-base was really low, it didn’t look good for going anywhere really so we stayed out to the south-east of the airfield waiting for the parachute aeroplane to come back in and then waited for the “all canopies down” call to indicate that all of the parachutists were safely down on the ground and it was safe for us to return to the circuit. We descended to 700ft and joined the circuit on right base to land. Above you can see our course, see we didn’t go very far at all. This data is captured on my iPhone using an application called CloudAhoy (www.cloudahoy.com) It captures your GPS position data and overlays it over Google Earth for you to study later on from a desktop computer. Disappointed that we were not able to go anywhere we cheered ourselves up with a bacon and egg sandwich and a coffee from the parachute centre. 2 o’clock came around quickly and it was time for my lesson with Katie. Today we were going to do an exercise that I had been waiting to do for a while, waiting because not that the weather had been too bad but because it had been too good! My usual instructor Mike is away at the moment so I am flying with Katie instead; it is interesting how instructors differ from each other in both the way they teach. I like the way Katie looks at things slightly differently, but saying that I appreciate the experience that Mike has, using them both has certainly helped me learn to fly. Anyway the lesson started with a pre-flight check of the aircraft and a walk around to make sure that everything was as it should be. Fuel wasn’t a problem as Adrian had put several litres in earlier for our trip that didn’t happen so I had about 6 litres more than I would have had usually; we tend to fly with 30 litres unless we are flying further afield. I have always used the physical check-list when starting up and going through the pre-flight checks, but more recently I have doing it from memory; this time I did it from memory and didn’t need to relate to the check-list at all; but maybe I should have because during taxi to the runway I realised that I hadn’t switched on the strobe or the fuel-pump! Although I would have noticed these before take-off having the physical check-list in front of me could have avoided this. During the warm up Katie said she wanted me to do some navigation at minimal operating level of 600ft. She wanted me to find and follow the disused railway from Chatteris to Somersham and then to Ramsey and then find my way back to the airfield. I made a course correction and started flying north-west hoping to see the disused railway branch I was after, I still couldn’t see it, I could see a golf course and then identified Ramsey on my left; I knew the disused railway was there but I just couldn’t see it. Anyway we continued on to Ramsey, past Warboys on our left and then Katie advised me to turn right as I was getting close to Upwood airfield which is used for gliding and the last thing we wanted was to get tangled up with that lot; I could see gliders on the ground but there didn’t appear to be any flying, no wonder really as the cloud base was so low but honestly I had forgotten it was even there. We followed a road leading out of Ramsey to the north which I verified against my compass so I knew we would be shortly intersecting the Forty Foot Bank which I could follow to end up being south of the airfield, and safe far enough outside the circuit. I could see Chatteris town in the distance so I knew we were on track. Coming up to a small lake Katie asked me to keep at 600ft and do an orbit around it without loosing or gaining altitude, I performed the manoeuvre as requested and was happy with it. We continued towards the airfield were I performed my airfield approach checks and made a radio call to make clear my intentions “Chatteris Golf Charlie Echo Golf Lima, joining the circuit extended finals” I forgot however to tell them I was going to be using Runway 01, oops. I lined up, avoiding the farm house to the south on our approach by doing a dog leg around it, back on the centre line, power-off 60kts stage one flap and nose down attitude, quickly followed by the second stage of flap, all was looking good on the approach but my speed was a bit erratic due to the blustery conditions and the fact that I wasn’t nose-down attitude enough. I touched down and immediately returned to one-stage flap for take off, full power and climbed out. 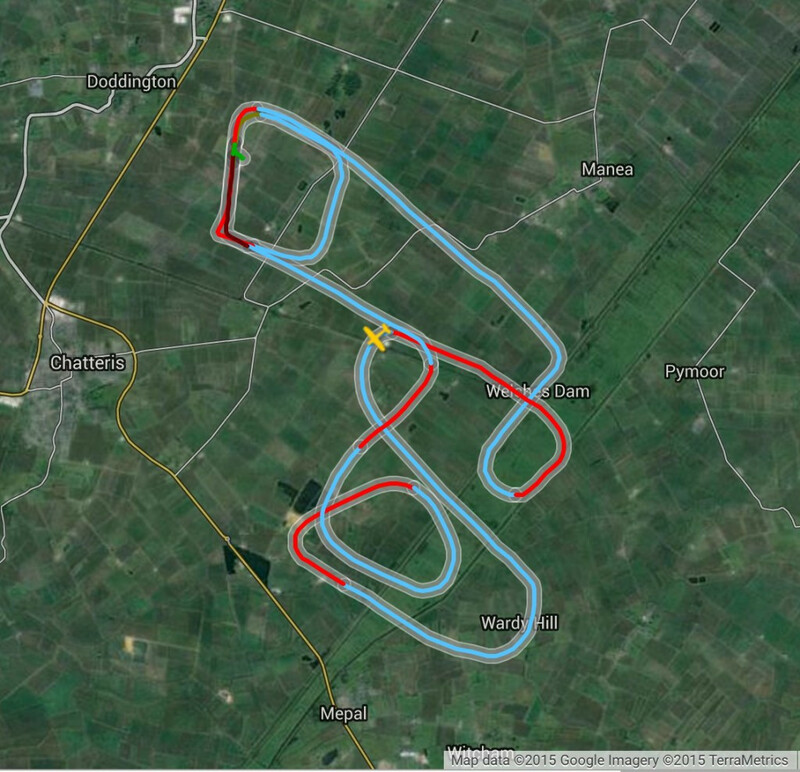 This time to perform a 500ft circuit, and a bit closer to the airfield than we usually perform a 700ft circuit. Another touch-and-go and round again, the next touch-and-go was a bounce and put power on to catch it and climbed out to just 300ft this time quickly retracting the flaps fully. This time at 300ft we performed an even tighter circuit closer to the airfield and avoiding flying over the RSPCA centre, a farm and a couple of tractors which were out in the fields ploughing. 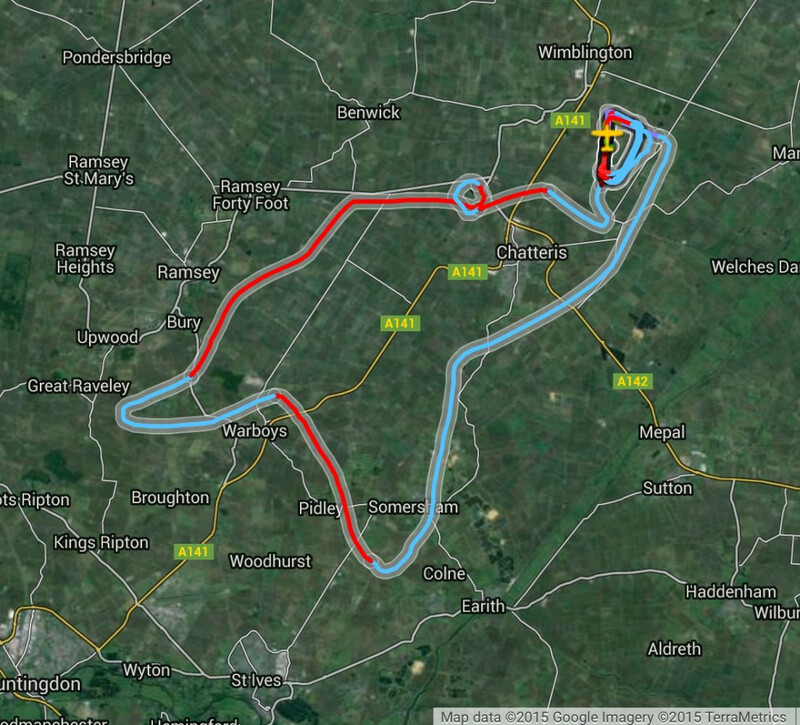 We did a couple of circuits like this and then went down to 200ft for more of the same. At such low level things look completely different, things happen really fast and you feel your airspeed is higher than you are used to, of course it is not it just feels like it because you are closer to the ground. At this point a bit of light rain started so on the next circuit we landed and taxied back to the hard standing. Generally, Katie was pleased with my flying but she was worried about my slow airspeed on approach, I was sometimes getting under the orange triangle which should be your minimum approach speed, but also keeping it under the maximum full flap speed. It takes a lot of concentration to make sure your approach speed is correct and at such low altitude to begin with there is a lot to think about and do. I learnt in this exercise that when flying at lower than normal altitudes your work load is increased because you have to do things a lot quicker than you are used to. Also things look different at this altitude, and keeping an eye on where you are on the map is a lot harder than it is at say 3000ft. Smaller A and B roads are sometime invisible, as are disused railway lines! Hoping that the weather improves for next time were I can do some practice on on my approaches and hope to overcome my approach speed problems very soon. By definition in CloudAhoy the blue is “airborne” and the red is “slow flight”. I was flying at 70 knots throughout so I think I may need to adjust my aircraft profile in the software to stop it showing “slow flight” when it is not, well not a C42 anyway. Previous PostPrevious First flight with a passenger! Next PostNext A flight from the wrong seat!